Residencies provide support and mentorship more consistently than other traditional preparation and alternative certification programs. In our research, we found that teacher residents receive significant mentorship and support during their residency year, more frequently than traditional preparation programs. Many programs also provide specialized training to serve high-need communities. For instance, the Kern Rural Teacher Residency in Bakersfield, California provides additional workshops and conferences specifically to train residents on how to work with English language learners. Furthermore, residencies frequently provide induction, which involves systemic supports and guidance for novice teachers in the first few years of their career. Residencies offer more incentives to continue teaching in the districts in which residents train. A number of residency programs partner with surrounding districts in matching residents with careers after their training. Resident graduates very often have guaranteed placements in districts where they know the students they served very well and as a result, transition to their full-time role with less of a learning curve. Furthermore, a number of programs provide financial incentives to continue teaching in the district. For instance, some programs such as the San Francisco Teacher Residency forgive significant portions of tuition loans at affiliated universities if residency graduates commit to teach in the district for at least three years. Prospective teachers face a host of options that vary in quality, cost, and duration. 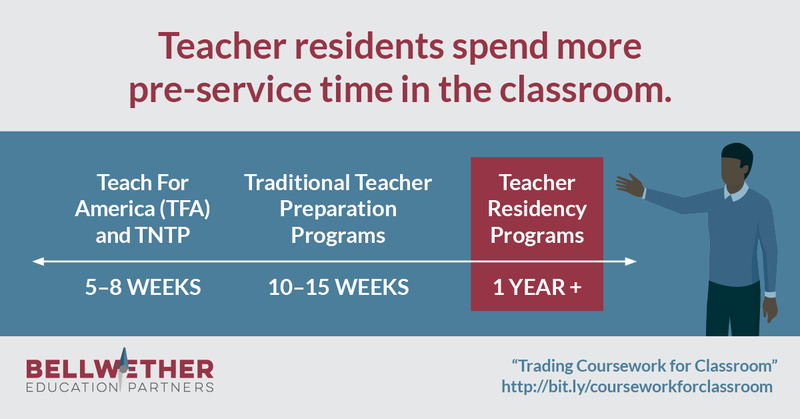 Learn more about teacher residency programs’ lowered risks, reasonable costs, post-certification support, and high program retention rates by reading Trading Coursework for Classroom: Realizing the Potential of Teacher Residencies.